iCode is a revolutionary new PIN code-based electronic locking system that allows managers and/or owners to instantly and remotely provide access to specific properties for specific periods of time, without the need for a key or keycard. It eliminates the need to visit a front desk or rental office, providing increased convenience and privacy. Because the code is software generated, it can be easily sent to users through remote media, such as text messaging or email. 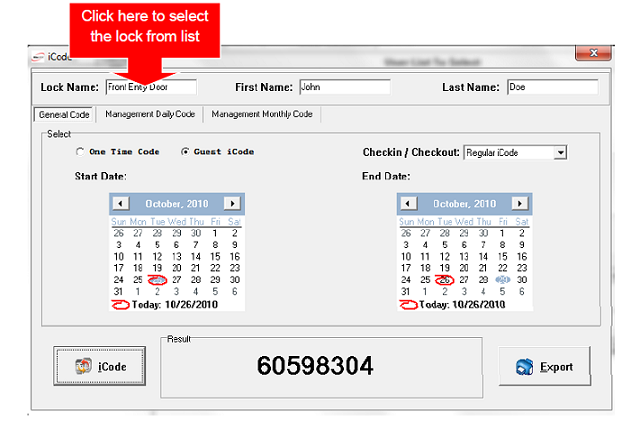 Others requiring access to a property, such as housekeeping and maintenance staff can also be given individual remote access codes with separate time restraints, making it easy to manage and track all access to individual units. iCode is a fully time generated keyless locking System; made up of a "stand-alone" door access control unit (Lock) combined with iCode Generator. Ritenergy started with a heavy duty and highly regarded Schlage deadbolt and then improved it by adding some amazing features! Now you'll have the abilty to add many user codes and time them per user and remote programming options. You'll have a choice of creating your codes two ways. You'll recieve a CD so a code can be generated on PC or laptop. please note: if your ordering more than one lock and want them keyed the same we can do that. Please see the options below. We have seen this lock sold elsewhere for more than $600! Can this lock be hacked? I have heard of other locks being hacked because of their direct internet connection. It can not be hacked because there is never any direct connection to the internet or a computer. Do you want to program the lock from a remote location at no extra charge? With the new iCode it's easy. Lets say you want to rent your condo. With the free software you can generate a code for a specific period of days. At the end of that time period the code evaporates and is then ready for a new code. Another example: same senario but now your renter has an emergency and has to cut short their time in your condo. Now you don't want the code you have given your renter to work after they leave because you want to give a new code to a new renter. No problem. You give the new renter a new code and that will automatically erase the previous code. Ingenious! The software to do this is free and is not the same as the audit trail software we sell as an option. The free software will be sent to you on a thumb drive or may be downloaded from the companies' web site.. Instructions will be sent to you with the lock on how to do this. Please note that some timing and programming functions and audit trail feature of this versatile lock can only be done with the paid for audit software. Inside the iCode lock is a computer chip that runs a complex algorithm. This algorithm is able to to compute what the code should be during any given time period. One way to think of it is that the lock is pre-loaded with codes. For example, if you wanted to give your guest access to your property from Friday at 2:00pm to Sunday at 12:00pm, your lock would already know that the code should be, say, 12345678. Now you just need something that will tell you (and only you) what your lock already knows. Amazingly you don't even need internet access to do this - only the software which can be on one or more computers or laptops so you can do this from anywhere. Now it's even better. Now you can program up to a thousand user codes remotely with a time stamp! I don't think any other lock can do this. No monthly fees or intermittent network hub connections to deal with - ever!